I was recently asked to speak at a conference in Boston. The conference was organized with separate tracks for venture and private equity – but I was speaking before the separation. In other words, my remarks had to be of interest to both venture capitalists and private equity investors, and was to be delivered before many had had their coffee. I have since received a lot of favorable comments on my remarks and thought readers might enjoy my sharing them here. Tech comes in waves, with waves often building on each other. The evolution of the tech industry provides a perfect illustration. The development of the microprocessor begat the PC. Once thousands of PCs were deployed it made sense to start connecting them together. Connecting them together created an impetus to make the connections fast and more useful. With faster and more useful internet connections it began to make sense to connect the cellphone network to the internet. Once cellphones were connected to the internet it became useful to make them smart. And as smart phones became ubiquitous it made sense to put them to work by writing apps to do just about everything. Today technology driven disruption is impacting more industries than ever. The reason is an effect that we are terming the “uberization” of the economy. I expect transportation company Uber needs little introduction. Uber’s smart phone app uses GPS to match taxi drivers with customers in real time, seamlessly handling all aspects of the payment and billing process. Revenues are reported to be in the billions and growing at triple digit rates. Uber recently raised private capital at a $41B valuation, making it one of the most valuable transportation companies in the world. But, you protest, I thought is was a software company? Well, if you look at its engineering department, everybody writes software or does math that can be translated into software. But does that make it a software company? Uber doesn’t sell software to taxi companies, and it doesn’t provide geolocation and dispatching services to them either. 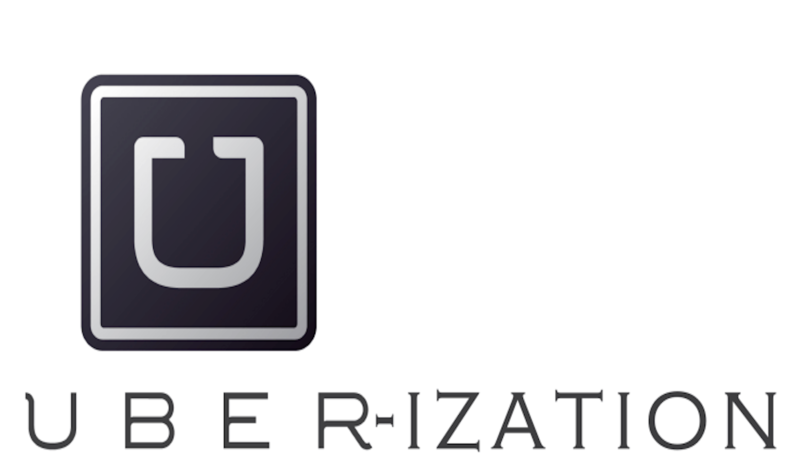 Uber has chosen to compete directly with taxi and livery companies around the world. The enormous advantages conferred by its technological innovations create a superior experience for its customers and drivers – and a superior business model for Uber and its shareholders. They don’t compete with Oracle or Microsoft. If you own taxicab medallions you know all too well who they compete with – you. Which brings me to my point. Todays crop of disruptive companies are using software to disrupt industries that may not have seen technological innovation in decades. Banking, pharmacies, hotels, executive search, food delivery, the list of industries that have technology based companies trying to Uberize them is almost endless. For the companies that get it right the rewards are triple digit CAGRs (we have seen many companies that report CWGRs – that’s W for weekly!) and businesses that can scale into the billions of revenue. And their established competitors often operate at the speed of sleepy oligopolies. The Uberization of the economy is one of the biggest and most exciting innovation waves of all time, which is all very exciting if you are a venture investor with a franchise in such investments. But those triple digit growth rates as often as not are coming out of the market share of existing businesses. And if you make your living buying and selling existing businesses that makes Uberization an important due diligence item in future investments.